I realized something important in the wee hours of the morning as I lay awake thinking about things. I had the answers to dealing with all this all along. I once described all living beings as being essentially separate only on a superficial level, much like mushrooms grow together because they are, in truth, one organism under the soil. One mushroom may be picked, but the organism lives on. I once wrote that heaven is wherever dreamers can consider their wildest notions without consequence, and that it is a state we can reach within our lives. I once wrote that the worship of prophets was false, but that all teachers had something that we could learn from. I once considered that reincarnation is not so much punishment as a simple cause-and-effect relationship, and that someone who is born into a bad life shouldn’t be looked down on because they did not consciously choose that misfortune; it was a consequence the same way a soccer ball hitting a fence is a consequence of its being kicked, even if the fence is not where the kicker aimed. When one has misfortune from the right intention but the wrong action, they should be treated with compassion, not with disdain. I came to understand that life has enough suffering and that making it worse with needless violence is a grave mistake; I totally agree that reducing the suffering of others is an important part of a well-lived life. I basically, I’ve turned Buddhist in all but name, and without knowing what I was doing (I really didn’t get Buddhism before and I didn’t really pay it much attention) I still managed to grasp nearly all of its core concepts on a level that is difficult to describe in words. I’m still not sure I want to call myself one because I think labels are silly and limiting, but I have to admit, I completely and totally get the Buddhist concept of how the world works now and I will continue exploring on my own and see what else I can learn simply by meditating, learning, thinking, and feeling. And what does this have to do with my recent posts, about feeling frazzled at finding out more details of everything? I just haven’t been applying what I knew. I was compartmentalizing too much and not allowing the transcendental concepts I’ve learned to be applied to this, out of fear I’d be seen as a flake, a new-ager, someone who was just wrapped up in a fantasy of their own making. But in doing so, I failed to see the whole point of the pain and joy I have seen across the two lifetimes I remember. I am right to refer to John Harris specifically in the third person; I am no more John Harris than a sparrow is still an egg. We grow, we evolve, we set up the dominoes, knock them down, then set them up again in a new pattern. I am wrong to seek that old tin box. It would not serve me in this life; it would only be an attachment to something that is no longer mine, and I hope it is still there in France, returned to the earth as a brown stain in the soil, just as the body I had back then has returned to the earth and nourished a beautiful willow tree. I can continue my research now, because I see that this is only a lesson to be learned, and not a wrong to be righted. Whatever pain, fear, and hurt I had within me as John Harris are things I must detach from, and whatever right or wrong actions I did, are things I must learn from. Don’t you hear my call? Don’t you hear me calling you? I suppose we’re all time travelers, who through many lives span inconceivable expanses of time and space between physical incarnations. Anyone who remembers a previous life can certainly relate to the devastating effects of the Twin Paradox because matter, so far as we’re aware, can only travel forward in time, never back. One who remembers a past life from long ago very vividly may as well have been on a space ship moving at the speed of light because so much time has passed that the world that you once took for granted begins to seem strange in hindsight. Incidentally, this was the song I was listening to when I had that memory of the flyover at the Copthorne Barracks, and seeing what would have then been a state-of-the-art Nieuport fighter (judging by the tab-like protrusions at the trailing edges of the wings). I’ve focused my attention more on the English side of the past, looking specifically last night at the village of East Coker where, according to census records, John Harris lived for a short time in his teens. I discovered that this village, unlike what I had previously thought, still has a great deal of old preserved buildings that look similar to some of the buildings I remember once being plentiful in the countryside around Yeovil (sadly, most are gone) and even though there is some new development I’m happy to say much of the town- for now at least- is in an exceptional state of preservation. The Yeovil Town Council had, more recently, discussed plans to develop the fields between Yeovil and East Coker into a massive housing estate. However, the idyllic village of so many ages ago that I may have seen as a teenager during Victorian times has something going for it that many other villages didn’t. East Coker was the subject of a poem by T.S. Eliot, and his ashes are even buried there at St. Michael’s church. Naturally, his fans have made their displeasure with the Yeovil town council known and the council has- at least for now- shelved plans to develop a housing estate on the edge of this beautiful old village. Thank you, T.S. Eliot, wherever you are now. Here’s hoping that when I finally go back to East Coker, I’ll find something I recognize because your fans made it known that the past need not be plowed under so carelessly. I may have mentioned before that I spent a year and a half in England in this life. I studied at an American university in Richmond, Surrey and very near the campus was a former hotel that had been converted to a military hospital in the First World War called the Royal Star and Garter. I hadn’t really thought about it, but it’s strange that I lived so close to that building. I even got to see its lovely Edwardian interior one evening when my university awarded scholarships in a ceremony there (we didn’t have the facilities for it on campus). Back in 2004, they were talking about moving everyone out to a more modern facility by 2005 and possibly demolishing this gorgeous old building to build a block of modern high-rise flats, but the university had already had its sights set on acquiring it if they could come by the funds (I think the price tag was something like 10 million quid, a lot for a small private university that most people have never heard of). According to Wikipedia, it’s had a brief reprieve, but will go up for sale again in 2013. As developers seem to be the only ones with the money to acquire such properties any more (that goes for the US too, sadly), I don’t see it ending well for what had once been a safe and welcome retreat for those who got “a Blighty one” back in the trenches. This building really does deserve to be a hotel again, or maybe a hotel/museum combination. It shouldn’t be destroyed, and I’m wondering how difficult it would be to set up a trust to save it if developers start eyeing it. I think I need to take a short break from researching or thinking about my memories. The series of confirmed or plausible memories that I’ve encountered in recent weeks has left me with a mixed sense of fascination and horror, with some melancholy and even pride thrown in. On the one hand the prospect that I may have indeed been a firsthand witness to history and a very brave man in a previous life has been an exciting prospect, but on the other hand the price of that privilege weighs heavy on my mind. In particular, while scrolling through the roads near L’Epinette on Google Streetview, I found a low ridge in someone’s horse pasture near the road that looked a bit like the dirt bank I remember sitting on around the time a shell exploded overhead, and although I am not sure if that shell ended my life as John Harris, it is probable that I did die very near that spot. Seeing the site of one’s own death is a very heavy thing to deal with, and I think it was harder for me than when I finally saw a photo of the headstone. I need some time to step back from this and focus on my current life for a while. In the last two weeks I’ve lost a great deal of the comfortable sense of unreality that defined my earlier research and although I will never abandon the search for my past, the grim realization that this is very likely a real memory has been a very distressing thing to come to terms with. I will return when I’ve calmed down a bit. If I have any more recollections I need to be braced for the possibility that these, too, will be confirmed in grim detail. The ones I fear the most are the recollections of the Ypres Salient. The noise, the mud, the stench of death, the horror of going over the top (and I must have if I was there) are not things one would want to experience again, and if those memories do come to the surface I want to be in a state where I can be calm enough to remind myself that the bullets and shells can’t hurt me any more. This is not an indefinite hiatus. I will check in with anything that comes up incidentally in the mean time so that I have a record of my recollections that I can verify when I’m ready to begin my research again. I may have identified one of the trucks I saw in a convoy past the trenches. It has the canvas roof, a “C” cab, a windshield, and most importantly of all, a visible chain drive (although covered by a fairing, but still visible nonetheless). 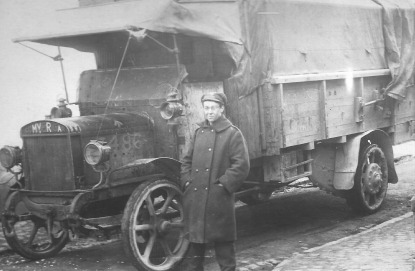 It was probably a Commer built around 1914, as in this photo. You can’t really see the chain drive very well in that pic, but I found another photo, this one of a 1909 model, with a close-up on that particular part. As for the color (if memory serves, it was blue), it would have been too early for that to have been an RAF tender, but it could have very well been a civilian truck brought over from England to help mobilize supplies (this was a common practice in the first year of the war). It’s still tenuous as to whether or not this memory is true, in part because the combination of features I mentioned could be something I might have easily guessed by my knowledge of vehicles (which is vast). The likelihood of finding a truck with that specific combination of features was fairly high. However, I’m not sure what the likelihood of finding that specific combination of features on a British make early enough to be the right time period would be; most of the early partial matches I turned up were American or German and from somewhat later in the war. While I try to objectively examine my experiences with what I can now call a very likely past life (because the confirmed details seem to outweigh my prior knowledge of WWI or the realm of coincidence at this point), I must also say that I’ve sort of had to compartmentalize this from my personal beliefs. The best way to describe my personal beliefs is spiritual after a Pagan idiom, though not strictly Pagan as I still have questions about a lot of those beliefs. This is to say, nothing in my personal beliefs as they are now would have contradicted the idea of reincarnation, but I had no presumption that this was at all true or absolute and I had serious questions about the merit of that belief. That being said, I’m also a student of the sciences (specifically anthropology with an interest in archaeology), and I’ve had to learn to discipline myself to not let personal beliefs lead me to a favorable conclusion. I find it very interesting that the tree next to John Harris’ grave is a willow because that, in many beliefs, is a tree between worlds; but I cannot immediately say that this was some kind of psychic antenna that guided me back to my own grave. As much as I’d like to believe these experiences affirm personal beliefs, I have to look at them for what they are: an experience that stands on its own and cannot have meaning forced onto it. One thought did hit me today though, while I was out and about riding public transport back and forth because I had nothing better to do (it’s been a boring week). I realized that even if this doesn’t confirm any of my current personal beliefs, it’s sort of a nail in the coffin for personal beliefs I’ve held in the past. Up until 2006, I considered myself a Christian. It was not a decision I tool lightly when I stepped away from it, and I must confess that it was Pascal’s Wager that kept me there as long as I stayed, even after the doctrine no longer rang true. And to be fair, I never thought I’d get a definitive answer to Pascal’s Wager as to whether or not believing as a faithful Christian would produce the desired results. But I have seen a photo of John Harris’ headstone, he was baptized and buried a Christian and, if the way he lived his life is any indication, believed with all his heart in God and Country. I am sure he believed he would be rewarded with an eternity in Heaven for his faith. But if I was John Harris in a previous life, that really is the last final thread from that belief severed, and I’m left with one square on Pascal’s Roulette Wheel (for that is what it truly is) that I know will not yield results. Having a past life also pretty much rules out most of the Abrahamic religions and any other faith that believes there is only reward or judgement after death (except for a few sects of all of them that do accept reincarnation as a possibility), and although I no longer feel any such faith is for me, I have to admit I’m a bit shaken from the completeness and finality that those bridges have been burned with. But I’m also left without the cold comfort of total darkness and oblivion too; oblivion, I think, would be a mixed blessing because it is a definitive end- and therefore tragic- but certain and without pain- and therefore at least marginally more comforting than having no idea where you’re going once you get to the next junction. Not having Heaven, Hell, or Obliteration is at once a relief and a worry, because the real question that comes with past and future lives is “why?” Is there anything beyond my own will that keeps my being together? Is there any being out there that actually cares where I go next, or will that just be a matter of random chance? Does death mean I will never see loved ones again, or are we reunited in different bodies even if we don’t recognize each other? And is there some goal or objective, or am I just drifting through space just the same as all matter? Concepts like reincarnation are supposed to help us make sense of the universe, but damned if they don’t just create more questions than answers. I really hope there’s a point to it all; I want to believe that this means we’re all evolving, changing, moving toward some form of physical and spiritual perfection, but are we really? I’ve gone from staring down the barrels of Mausers to staring down the barrel of a Magnum Mysterium. Suddenly the Mausers don’t seem so intimidating. But I never shrank from going Over the Top. I’m back to barreling into uncertainty again, this time the uncertainty of discerning meaning in what turns out to be a very weird universe. Looks like I find myself in an existential No Man’s Land, and now the only thing I can do is advance and hope there are no nasty surprises between here and the truth. It took me many lifetimes to figure this much out; I don’t expect a quick answer and I don’t expect to know the truth in this lifetime, but I’ll certainly go as far as I can.